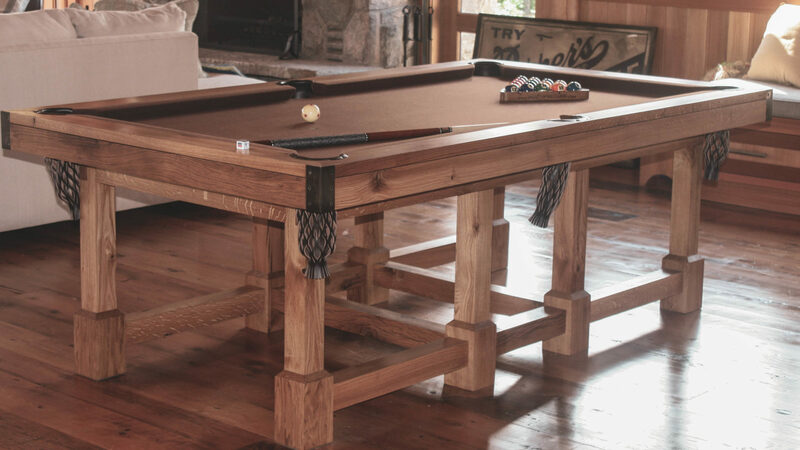 When purchasing a Custom Table by Tschirhart’s Custom Billiards, the choices are nearly endless. Let us take you step-by-step through the table features and outline some of the choices that are available with our products. There is a difference when purchasing a custom table and that difference is made by you, our client. Please view our Custom Line for an existing Custom Design or contact John to Custom Design a table unique to you. Architect and Designer commissions accepted. Traditional, contemporary, minimalist or totally out of this world… Victorian, Gregorian, or Oriental… Simple, Ornate, or Opulent… The Choice is yours! The frame, legs and skirts are produced from “Select and Better” solid wood, stone or steel, giving you real value that will last for generations. A laminated rail with a hardwood cap provides a solid bounce and makes a beautiful piece of furniture. Using Exotic Woods add to that natural beauty also giving you a more durable, scratch resistant, low maintenance finish. Whatever wood you have chosen for your legs and frame is used as a standard, or you can choose one of the following exotic woods as a standard for yor rail caps; English Chestnut, Red Gum, Imbuya, Birds Eye or Curly Maple, African Paddock, Pecan, Sapele, Walnut, Wedge. However wood does not need to be your choice. If your design and decore requires another look. We find the material that will suit your design needs. Upgrades are also available: With a Tschirhart table you get Solid Wood, giving you real value that will last for generations. All woods are subject to availability. Steel Block Rails are also available. The standard is 1″ for 7′, 8′ and 9′ tables; 1 3/4″ on the Empress Line and on all 12′ tables. We also have some 1 3/4″ for 7′ Steel rail tables & 2″ for 9″ Steel rail tables. Most slates just meet WPBA standards of +.020″ length and +.010″ width. At Custom Billiards we hand hone all Empress table slate to +.005″ or better. With a hand honed slate you not only get a flatness that meets WPBA standards, you get one that exceeds it, giving you decades of worry free and accurate play. On Pool tables we use German Artemis rubber. For Snooker tables molded & matched sets of “Northern Rubber” of England is our standard. Yes, Northern Rubber for World Championship Snooker Tables. It is about four to six times the cost of conventional rubber. However, it adds up to only about .05% to the cost of a standard table. The durability and bounce is far superior, giving you accurate, consistent play for decades. Increased bolts per rail is another standard. I use four as a minimum more depending on the size of the table. Also I use Grade Five, Zinc plated, Fine thread bolds into cold rolled or Stainless T-Nuts inserted into the rail. This too provides low maintenance increases bounce and accuracy, making your game more enjoyable. Hand-sewn pockets are a standard feature of our tables. To enhance the durability of the pocket rail mounts as a standard I insert Copper Bushings in the rails reducing wear to the rail and assuring the longevity of your investment. This is the standard that I am most proud of. For many years I have been working to perfect a Hand-Rubbed Hot Oil and Wax finish. Oil enhances the natural beauty of the woods like no other finish. For the most part the biggest difference is this finish is in the wood, as opposed to a build up on top of the wood. The end result is a sort of “Antique French Polish”, or polished wood with “21rst Century” technology. At the same time this finish is much more environmentally friendly. Adding to preserve our air, forest and health. Most mass-produced tables use NGR and Lacquer finish. Though lacquer is very hard it does chip and wear. Your once new table starts to look very used despite your care. With my standard hot oil and wax finish, you get durability and peace of mind. Mind you we realize not every table will use a natural wood grain finish. So when your design requires some different color we will generally use Automotive grade finishes. At any rate we research and use the best finish we possibly can for each project. Every Tschirhart table gets a Customized name plate to suit the table design, Solid Brass, Stainless steel, or whatever best suits the table. We can also carve directly into the rail of the table. Customizable and unique to your family, the name plate is what completes your table. It will identify the work to others for generations, truly making your table a beautiful heirloom. Now at the same time we have come to realize some simply do not want a nameplate. Feeling it is too commercial for their personal custom table. We respect that. If we can we do like to leave our “mark” or name in a discrete spot out of plain site. We do hope that years from now this identifying mark will add value for your posterity. The bottom line is your satisfaction.